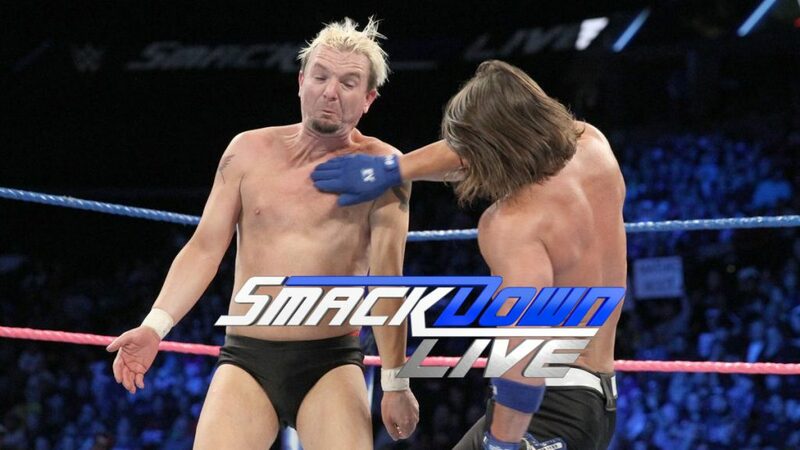 Last week, AJ Styles named James Ellsworth as his opponent. After getting a win over Styles with the help of Dean Ambrose, James Ellsworth will get a World Title shot tonight. Dean Ambrose gives James Ellsworth one of his brand new shirts. This could have been an okay match, but it was just more mind games. Bray Wyatt came out mid-way through the match in a casket, and he attacked Orton not long after that. Bray Wyatt opens the casket at ringside, presumably to put Randy Orton in it, but Kane is already inside. Orton and Kane beat up Wyatt and Harper, but the Wyatts disappear when the lights go out. Andrea D’Marco welcomes AJ Styles. Styles is upset about having to defend his title against James Ellsworth. He’s afraid that Dean Ambrose will find a way to make WWE as bad as WCW when David Arquette won the title. He vows to take Ambrose apart piece by piece. Good match. Alexa needed a good showing, and she got one. It showed how she can use her brains to beat someone who might be a little tougher then her. Renee Young asks Alexa Bliss about Becky Lynch. Alexa says the fairy tale is over. Apollo Crews is already in the ring for a match (with Dan Engler as ref). Curt Hawkins heads to the ring and gets on the mic. He calls Apollo Crews “Apollo Lose,” so Crews punches Hawkins. Hawkins is upset, so he leaves without competing. Carmella heads to the ring. She complains about Nikki Bella getting more attention than her until Nikki’s music plays and she heads to the ring. Nikki tells Carmella that she wants to hear what she has to say, so Carmella insinuates that Nikki is only getting attention because she’s John Cena’s girlfriend. Nikki tells Carmella she should be ashamed for trying to take away her accomplishments by saying her career is what it is only because of her relationship with Cena. Carmella responds by showing a cut of Total Bellas that shows Nikki as a needy girlfriend. Nikki applauds Carmella for her editing skills, then talks about training hard to come back from her neck injury. Carmella gets in the last word by telling the “truth” about Nikki. Renee Young asks James Ellsworth how he’s feeling. He’s nervous, but he knows his life is about to change forever. This was a fine six-man tag. The ending could have been better (it didn’t take much for the pin to happen), but other than that I enjoyed the match. Natalya wants to be in the 5-on-5 women’s match at Survivor Series, but Daniel Bryan asks her why he should put her on the team. Natalya makes a case by quoting Whitney Houston and showing Bryan pictures of her cat. Jack Swagger got destroyed. This was practically a squash match. Natalya is still showing Daniel Bryan pictures of her cat when Dean Ambrose walks up in a referee shirt. He’s excited about being the ref in tonight’s main event, but Bryan tells him he can’t ref a World Title match. He can do anything else he wants though. Ambrose says he’ll do that. As a comedy match, it was alright. There was one moment that was kind of fun, but it was really more about seeing a guy who really should never be in the position he’s in get the moment of a lifetime. That’s really the only good thing here, because a match like this doesn’t do much for the Ambrose/Styles feud in my opinion. I understand that it annoys Styles, but there’s not much development. It seems like a placeholder until they figure out the next turn in the story. This show was okay. It didn’t feel like a lot happened, but it will be remembered for the title match. There wasn’t really a lot to choose from on this show. As far as quality wrestling, this show was pretty light. Still, this match was fine.